Birdi Chand Well is one of the most prominent structures situated at the north east corner of the city. It is surrounded by four large slender towers like structure known as minarets. Two minarets are primarily symbolic to the presence of step well. Water is a limited and rare resource in deserts. Hence step wells were considered to be a temple for the livelihood. In all likelihood you may be greeted with the presence of a temple at these wells. Keeping with the tradition Birdi Chand well also has a Hanuman temple in the complex. You can also find a ‘Neem’ tree nearby, which coherently provides the twigs to localities for cleaning their teeth. It was constructed by a rich Marwari businessman as a community centre for social purpose. It is not only a source of a precious commodity – water, but also serves the purpose of a social centre where women often would exchange important news. Not necessarily women but the well provided a platform to elderly people who would gather at the steps and discuss the political and local subjects. Build in an era when women often were not allowed to venture out on their own for recreational activities, such step wells provided them with much desired break and an opportunity to communicate with the society. Chatris basically are dome shaped, elevated pavilions utilized as an important facet in Indian Architecture. 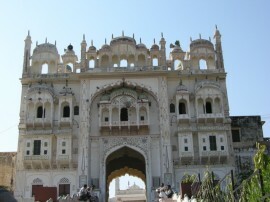 Shekhawat Rajputs have primarily contributed a lot in the adornment of Jhunjhunu. Though many of these Chatris have been transformed into schools still quite a few remains of beautiful paintings can be seen on the inner walls which are a true reflection of the craftsmanship of that era. One cannot refrain from noticing the attractive murals and inscription which now have turned into ravages by due negligence. In Hindu tradition Chatris are portrayed as the basic structure of Mughal architecture. The term ‘Chatri’ is a Hindi word which means an umbrella or canopy. They were mainly erected at the cremation sites of wealthy and affluent individuals. The traditional structure may consist of one dome on four pillars transformed into a building surrounded by many domes along with basement and several rooms. In Jhunjhunu you will find the same picturesque site inside the Chatri as that of a haveli. Shekhawat Rajputs no doubt have contributed their bit in building Jhunjhunu. Thakur Sardul Singh was a very brave and efficient ruler who conquered Jhunjhunu from Nawab Rohilla Khan in 1730. Zorawar Singh was the eldest son of Thakur Sardul Singh, borne by his first wife. During his tenure as a ruler he build Zorawar Garh fort in 1741. Once upon a time a sight to see has now turned into ruins. The part which still has some ravages left from the constant negligence of property owners has now been transformed into government houses and town jail. ‘Zenana Complex’ which once uses to be a bright and alive with constant hustle and bustle of the royal ladies now lies barren and broken. In absence of due care to preserve the rare and ancient architecture of these Forts, the buildings now don’t have much scenic beauty to offer. 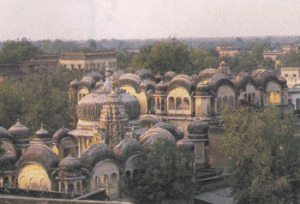 Kamruddin Shah’s dargah is another tourist attraction of Jhunjhunu bearing much historical importance. It is situated at the bottom of the Kana Pahar hill. It is a complex which consists of ‘Madrasa’ (Schools with Islamic traditional teachings), a Mosque (masjid) and a ‘Mehfilkhana’. The Mehfilkhana are the typical concert halls made for the purpose of holding the gathering of people where religious songs were sung. The Dargah build in the mid 19th century, is a tomb of a Muslim saint- Kamruddin Shah. He was born in 1784. A well constructed ramp can be seen leading to the huge and imposing gateway. The view from the rooftop is predominantly eye catching. Few but beautiful fragments of paintings exhibiting floral motifs can be observed around the courtyard, especially towards northern and eastern sides. Many of these probably have already been whitewashed. A small structure resembling a pyramid can also be seen inside the complex. This structure was erected on the demise of the infant son of Major Forster in 1841. Saint Kamruddin Shah’s dargah was a historical landmark in Hindu Muslim harmony. A strange depiction of this harmony between the two communities can be well seen at the entrance, in the form of a ‘Swastik’ symbol. The legends of kinship between Kamruddin and other Hindu saints are widely spoken of in Jhunjhunu.